We've worked with dozens of contact centres across the world and we've seen dramatic improvements almost instantly. Our case studies demonstrate how we were able to achieve such success. CareCentrix is a leader in providing health guidance and support care to the home. The company manages 26 million members through 8000 provider locations, with the help of 1600 call center agents. On average, agent performance increased by 6% after implementation of nGAGEMENT platform and schedule adherence among agents improved by 20%. 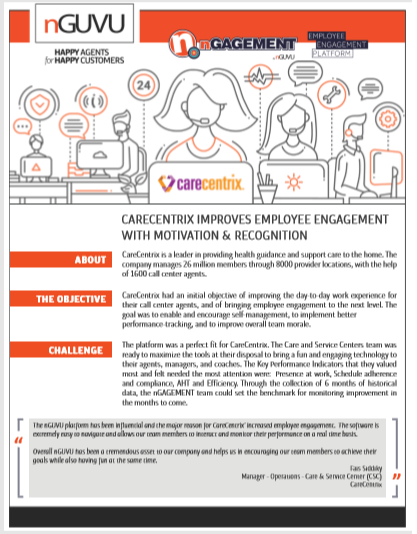 Discover CareCentrix employee engagement project success. LASIK MD is the leading provider of laser vision correction in Canada. Over half of all laser vision correction procedures in the country are performed at a LASIK MD laser eye centre. nGUVU spoke with Steve Lapierre, Director of the Lasik MD Patient Care Center, about his experience with nGAGEMENT, nGUVU’s solution for Workforce Engagement Management. In our latest customer success story fact sheet, we describe the implementation of our nGAGEMENT solution at Canada’s largest independent contact center and leading Business Process Outsourcing (BPO) organization. Learn about how nGUVU leverages Gamification and Machine Learning to increase employee engagement. Get the latest research data on performance management and compliance adherence.